The University of Kentucky Press has re-issued Jennie Benedict’s Blue Ribbon Cook Book. The recipe for her famous Benedictine spread, conspicuously absent from previous editions, appears in the re-issue. Susan Reigler, former Louisville Courier-Journal restaurant critic and author of the Compass American Guide to Kentucky and Adventures in Dining: Kentucky Bourbon Country has contributed a new introduction. cooking and was a creator as well as replicator of classic dishes. cosmopolitan, from spoonbread and sugar pie to lamb chops. J.P. Morton & Company (of Louisville) published Miss Benedict’s autobiography, The Road To Dream Acre in 1938. Although I’m off today, I worked on some auction listings; including one for the Hunter Sifter Cook Book. The Hunter Sifter Cook Book contains advertisments for a number of Cincinnati businesses. 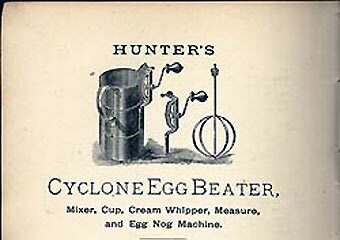 Several Hunter Sifter M-f-g Co. products are advertised: the Sifter, Cyclone Beater, and Safety Hollow Ware. After further consideration, the items made sense. A meat saw cuts up a carcass. A pail or bucket carries water or milk from its source to the kitchen. But for a “sugar box,” sugar hardens into a rock in the moist environment of a kitchen, or worse, becomes home, sweet home to a family of worms. Stainless steel and plastic had not yet been invented, so wooden, iron, and steel implements held, chopped, mixed, heated, transported, and safeguarded ingredients. Mousetrap made the list. Read about the lnglenook Cook Book. 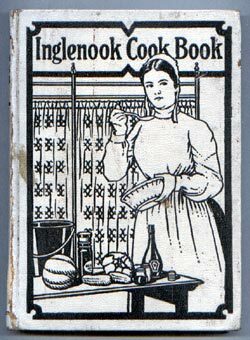 1901 | Brethren House first publishes the Inglenook Cook Book. The recipes were gathered from Sisters of the Brethren Church, Subscribers and Friends of the Inglenook Magazine. The book was among the earliest English-language Pennsylvania Dutch Cookbooks published in America). 1913 | Inglenook Magazine ceases publication. 1942 | Brethren publishes a sequel under the same title, Inglenook Cookbook. The new book contains more modern recipes collected from 4000 women. 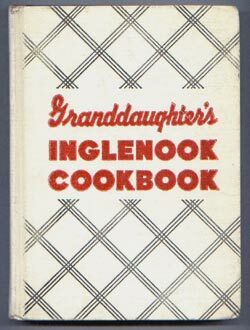 1958 | Harper & Brothers imprint of the 1942 Inglenook Cook Book published under the title: Grandaughter’s Inglenook Cookbook. 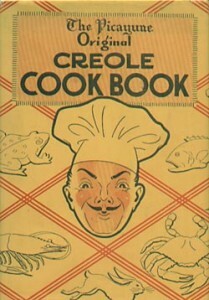 1970 | The Brethren Press reprints the 1911 edition of The Inglenook Cook Book. 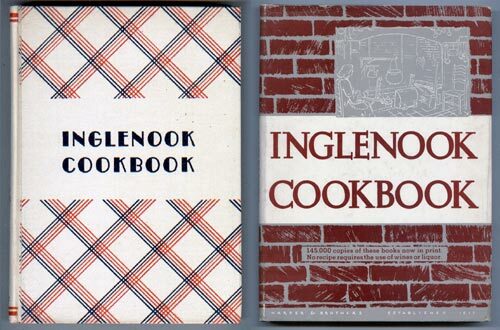 1976 | The Brethren Press reprints Grandaughter’s Inglenook Cookbook.